APCs are paid to journals to publish an article as open access. They are most often paid by the author’s institutions or research funder. In the UK, the Reseach Councils UK (RCUK) and the Charity Open Access Fund (COAF) make block grants available for APC payments. APCs are a small but growing part of a larger picture: journal expenditure. It is necessary to look at both APCs and subscriptions together, as both are part of the landscape of publication costs. Institutions pay for both APCs and subscriptions as part of the total cost of ownership of their academics’ output. It is necessary to look at both APCs and subscriptions together, as both are part of the landscape of publication costs. The first half of this report looks at article processing charges and subscription payments from UK higher education institutions. It looks at national trends in the number of payments, overall expenditure, and average price. It then takes a closer look at APCs by institution, publisher, type of journal (hybrid or full OA), and licence used. The second half looks at subscriptions expenditure from UK institutions. Overall library budgets are compared with subscriptions expenditure. Trends in subscription payments are shown at an institutional and at a publisher level, and APCs are compared with subscription expenditure. This report uses data collected by the Jisc total cost of ownership (TCO) project collected for the years 2013-2015. The TCO project collects data from volunteering institutions, aggregates it, and releases it openly to raise awareness about APCs (Jisc Collections, 2015). The project was launched in 2013 with 21 institutions, and has now grown to include 40 institutions.1 17 of these are Russell Group (Jisc, 2015). Jisc TCO data has been merged with RCUK and COAF data to give a more complete picture.2 The RCUK data covers APCs paid for with RCUK block grants. 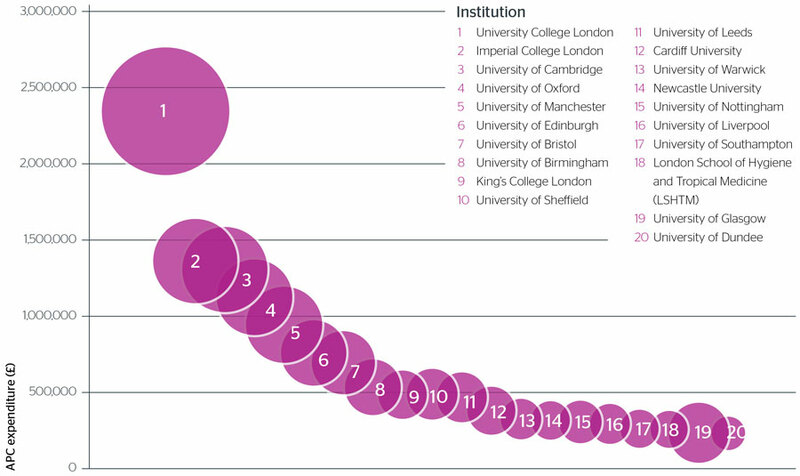 It comes from 70 institutions across the UK (Jisc, RCUK, 2015; Lawson “RCUK”, 2014; Kiley, 2015). COAF data covers APCs reported to COAF: 36 UK universities receive block grants to publish research funded by COAF partners (Wellcome Trust). TCO, RCUK and COAF have aligned their reporting standards, so data between the three sources can be compared directly. The dataset used represents the most complete picture of APCs paid by UK institutions available. However, there are several potential sources of error to keep in mind. One is that Jisc TCO, RCUK and COAF all have different reporting periods. Jisc TCO’s period 1 January-31 December; RCUK’s is 1 August-31 July; and COAF’s is 1 October-30 September. The most recent year-long period for which all three data sources are available is 1 August 2014-31 July 2015. As a further complication, the spreadsheet asks institutions to record three dates: the date the APC was applied for, the date it was paid, and the date the article was published. For the purpose of this analysis, APCs are filtered by the date of publication as, from an accounting perspective, this is the date at which the publisher’s obligation has been fulfilled and an institution can claim an APC as an expense in a balance sheet. For charges to make articles open access retrospectively, the date of payment (when known) is used as a proxy for the date the article was made open access, which would be the date the expense is incurred. A second known source of error is that many APCs are not available. RCUK and COAF datasets cover only APCs paid for from block grants, and do not include APCs paid for by other funders or by institutional funds. The Jisc TCO dataset includes APCs paid from all funds. Even this dataset, however, misses APCs paid ‘in the wild’ by researchers. There is currently no estimate of how many APCs paid by researchers go unrecorded. A third source of error comes from APCs which are offset from subscriptions through vouchers, prepayments, or discounts. These APCs are difficult to record accurately since their full cost is not paid directly.3 As offsetting and similar agreements become common, Jisc is working on ways to represent APCs paid through these means reliably. Finally, data is for the most part entered by hand and therefore contains inaccuracies due to human error. Combining data from several sources means that there are duplicate values which must be removed. Every possible effort has been made to clean and deduplicate this data, but it is expected that some inaccuracies remain. When possible, missing fields have been supplemented by CrossRef and PubMed records4. There is no data available on the number of APCs paid in the UK each year. Jisc TCO recorded a yearly average of 251 APCs per institution: the values, however, ranged wildly, with some institutions recording as few as 11 APCs and one outlier recording over 1,600. The median yearly number of APCs per institution is 111. Combined data from Jisc TCO, RCUK, and COAF shows 10,762 APCs were paid in the 2014-2015 reporting period, but there are no doubt many more that were not captured. 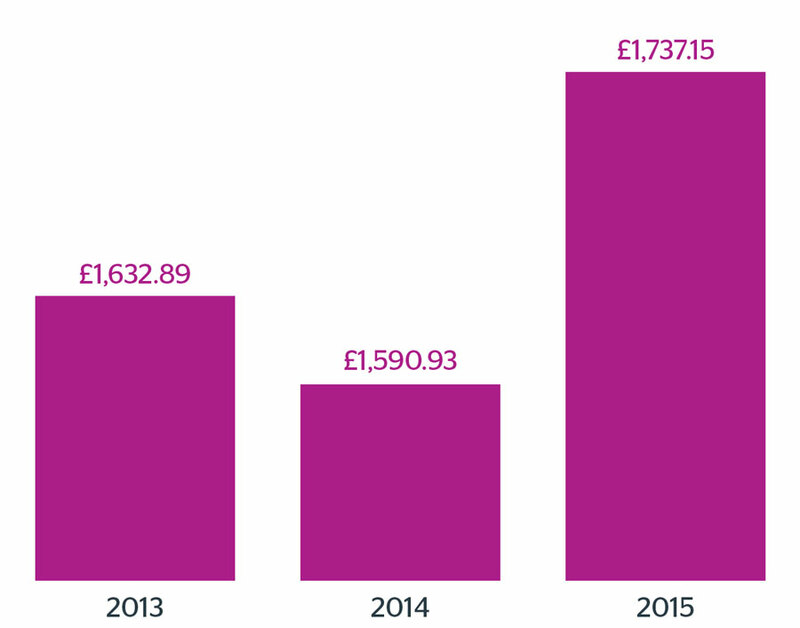 We calculated an average APC of £1,745 for 2014-2015, and a median value of £1,680. Several other studies have arrived at different values. Björk and Solomon’s 2014 study estimates an average APC of $1,418-$2,097 (£938-£1,386) in full OA journals and $2,727 (£1,804) for hybrid journals (Solomon and Björk, 2014). Another study found that the average APC for the University of Nottingham in 2010-2011 was £1,216 (Pinfield and Middleton, 2012). One reason for the differences in estimates is that, as this report will show, large variations in APC charges exist across institutions, publishers, and journal types. Perhaps most influential for the UK was the 2012 Finch report’s estimate, based on Outsell Data, of £1,500-£2,000 (Working Group on Expanding Access, 2012). Although other data available at the time suggested the average APC was lower than that figure, the estimate has proved to be a self-fulfilling prophecy as institutions have come to expect to pay this amount (Lawson, “APC Pricing”, 2014). For our data, APCs were relatively evenly distributed around £1,700, with a long tail of more expensive APCs ranging up to £5,600. The total expenditure on APCs for the August 2014-July 2015 dataset is £16.7 million. This should be considered a minimum, as there is no way to tell how many APCs have gone unrecorded. Björk and Solomon estimate that over $182m (£120m) were spent on APCs globally in 2012, and that expenditure is growing at a rate of 34% a year. (Björk and Solomon, 3, 2014). Assuming their calculations are correct, global expenditure would be £289m in 2015. APC prices are distributed around £1,700, with a long tail of more expensive APCs. Half the values are between £1,259 and £2,116. The number of APCs is skyrocketing. Between 2013 and 2014, the number of APCs doubled. Growth remained strong in 2015, but not as strong as in the previous year. One reason for this may be that RCUK funds were introduced in 2013-14 to pay for APCs, and 2014 was the first full year in which they were available. In 2015, growth had to come from within the RCUK grant or from institutions’ own internal funds. 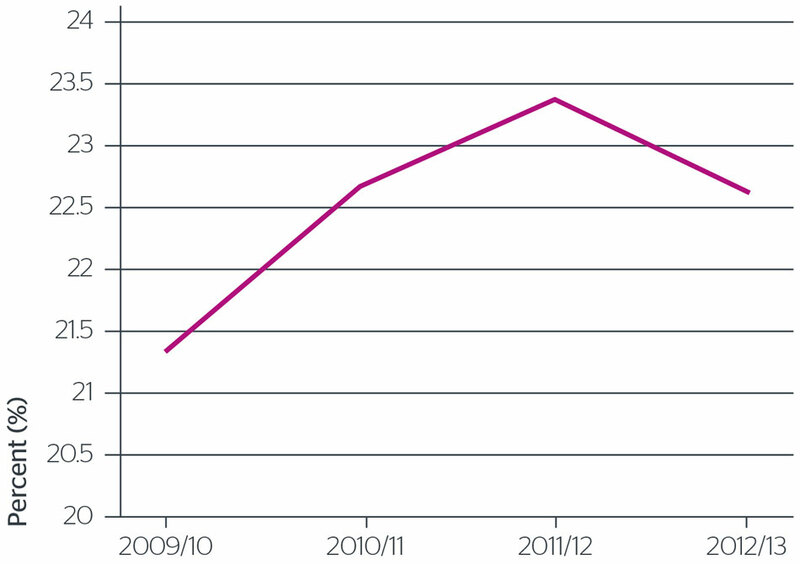 APC expenditure doubled between 2013 and 2014, in part due to the introduction of RCUK funding. Overall, the increase in expenditure outpaced the increase number of APCs, due to a rise in average cost of APCs. The average APC dipped in 2014, then rose in 2015. One reason for the dip in APCs may be the introduction of new offsetting deals which came into effect in 2014: Sage, for example, reduced its article processing charges in 2014 then raised them in 2015. 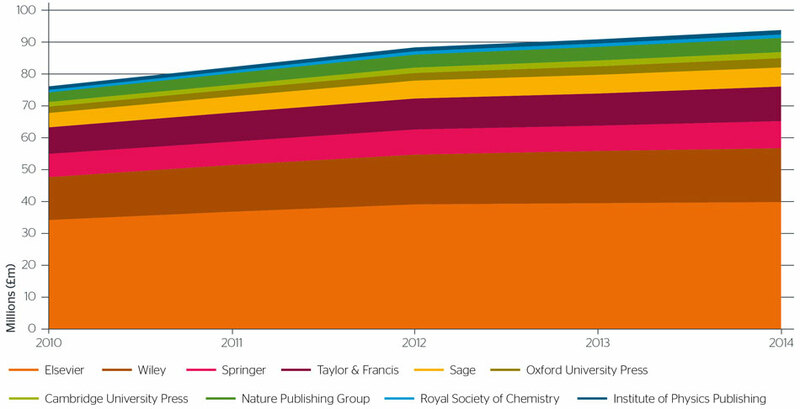 Royal Society of Chemistry’s voucher scheme, which came into effect in 2013, and Wiley’s offsetting deal, which was piloted in January 2015, led to many institutions being unable to accurately record APCs paid through these schemes, which may have led to prices being skewed in these years. The UK’s rise in average APC has remained low in comparison with other countries, perhaps due to offsetting deals—Austrian Science Fund (FWF) found an increase in average APC of €394 (£306) between 2014 and 2015 (Rieck, 2016). The data is skewed by one outlier whose internal policy for funding APCs changed in 2015. With this outlier removed, growth appears more steady. The average APC dipped in 2014 and rose in 2015. Expenditure across institutions varies significantly. University College London (UCL), the largest spending institution, spent £2.3m in the August 2014-July 2015 period. 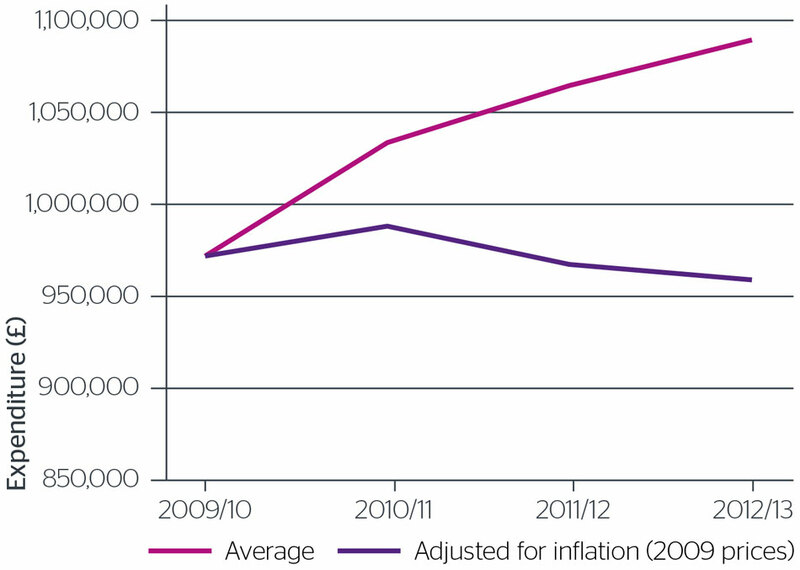 The average institution’s expenditure is less than one-tenth that at £208,000. However, even this number is not representative of the expenditure of the majority of UK universities as the data is skewed by a handful of universities who spend a large amount. The median expenditure is far lower, at £68,000. The average APC paid by institutions varies. When we compared the average APC paid across institutions, we found that most spent on average £1,500-£1,900 per APC. However, a significant subset spent over £2,000 per APC, while others spent less than £1,500. This chart shows the twenty institutions who recorded the most spending on APCs. Even within the top-spending institutions, expenditure varies dramatically. Size represents number of APCs. One institution asked that their data not be shown in this graph. There are several possible reasons for this variation in pricing. One may be that institutions have different budget caps for funding APCs. A second reason may be research patterns within institutions. APCs for science publications tend to be significantly higher than those for humanities and social science, so institutions with a strong scientific focus may spend more on average. Similarly, researchers from some institutions may be more likely to publish in prestigious journals that certain institutions benefit from offsetting deals or discounts which reduce their APC expenditure. Increasing transparency around APCs will allow universities to investigate the reasons for these differences and to assess the value for money for their APC spend. Most institutions spend on average £1,500-£1,900 per APC. A few large publishers capture most of the market share. Elsevier makes up nearly a quarter of APC expenditure, and captures 1.4 times as much revenue from APCs than its next nearest rival, Wiley. Comparing data from 2013-2015, we see that publishers’ market shares have remained broadly similar in 2015. 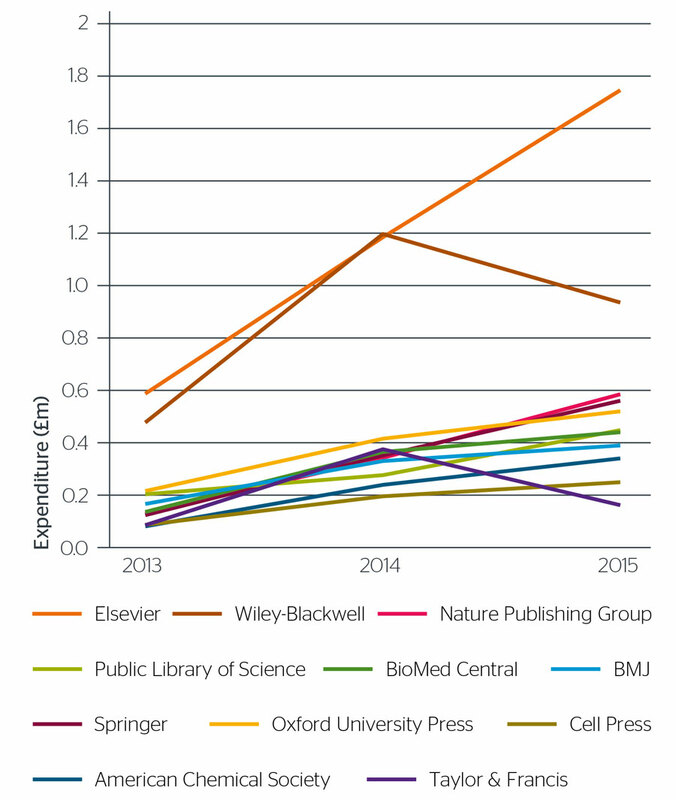 There are shifts towards full open access publishers (especially PLoS) and high end publishers Nature and Cell Press. Publishers with offsetting schemes in place have maintained average growth in APC number and revenue. They have not seen a significant increase in the number of APCs paid to them. One reason for this is that researchers are still choosing where to publish based on factors other than APC price. Elsevier, a major publisher with no offset deal in place, has seen high growth in revenue. This shows that there is currently no penalty for publishers who reject offsetting deals. 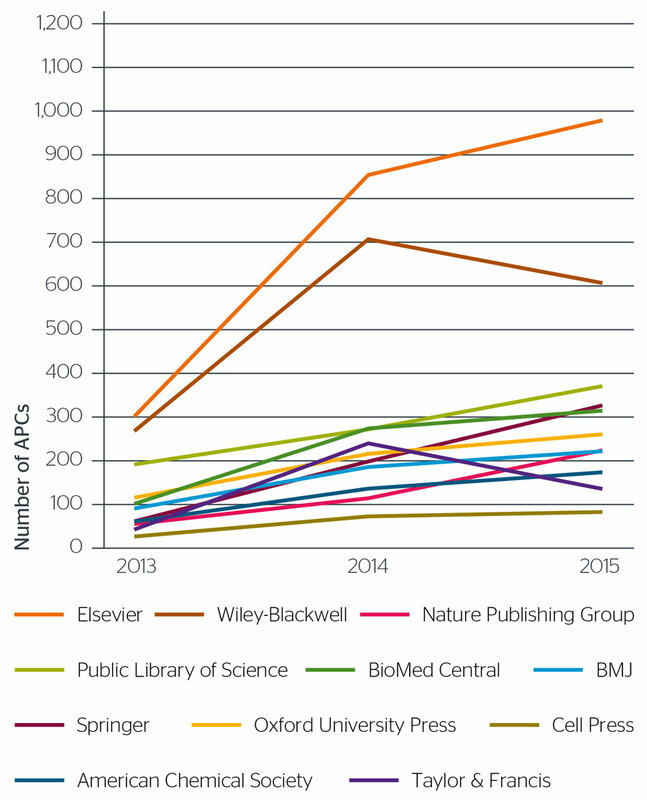 Elsevier’s revenue from APCs increased significantly in 2015. Wiley’s revenue appears to have dipped, but this is partly due to offset APCs recorded at £0. APC pricing varies significantly between publishers. The highest average APC charged by a major publisher is £3,087, much higher than the average APC of £1,744. Most publishers’ APC prices are beginning to converge towards the £1,500-£2,000 estimate given in the Finch report. As institutions gain awareness of APC pricing and form expectations of how much they are willing to pay, publishers adapt. The initial wide variety in APC prices and their general convergence shows that APC prices are not grounded in the actual cost of producing an article but rather are reflections of what the market can bear (Lawson, “APC Pricing”, 2014). The report’s estimate of £1,500-£2,000 may have encouraged cheaper journals to raise prices in order to be seen as high quality. There is a large variation in APC pricing across publishers. The highest average APC charged by a major publisher is over £1,200 higher than the average APC. The average APC is beginning to converge and shows a general upwards trend. Hybrid journals make up 80% of APC expenditure in 2014-2015. In order to determine which journals were hybrid and which were full OA, the journal’s ISSN was looked up in the Directory of Open Access Journals (DOAJ). As Jisc TCO data for 2013 does not include ISSNs, trends are shown for 2014 and 2015 only. The average APC across hybrid journals is consistently higher than for pure OA journals. This reflects the fact that the imprints which charge the highest average APCs, such as Cell and Nature, tend to publish hybrid journals rather than full open access. The average APC for a hybrid journal is £1,882, and for a full OA journal is £1,354 in the period from August 2014-July 2015. These averages are similar to Björk and Solomon’s 2014 estimates of £938-£1,386 for an OA journal and £1,804 for a hybrid journal (Björk and Solomon, 2014). The majority of APC expenditure is on hybrid journals. This reflects both a greater number of articles and a higher average APC in hybrid journals. The average APC is increasing more rapidly overall for full OA journals. In the Wellcome Trust’s analysis of COAF data, they posited that open access journals published by subscription publishers tend to have higher APCs, and authors are publishing more articles in these journals. In this analysis, we found several possible explanations for this increase. One is that Elsevier’s Cell Reports, a popular fully open access journal, increased its average APC by approximately £500 in 2015. Another is that PLoS journals’ average APCs have increased £50-£150. A third reason is that there are increasing numbers of articles published in expensive full OA journals such as Nature Publishing Group’s Scientific Reports and Nature Communications. 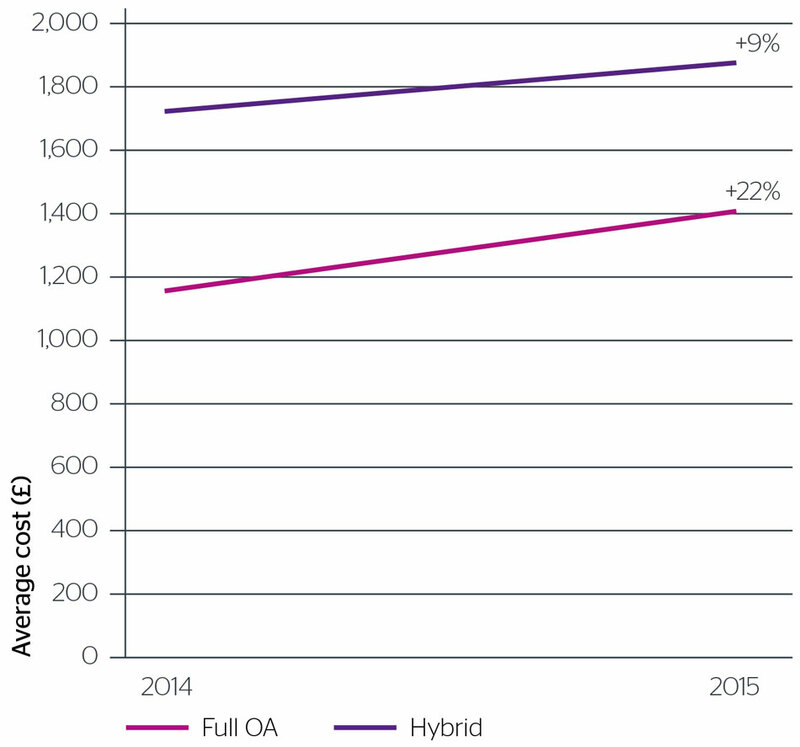 The average APC for hybrid journals is consistently several hundred pounds higher than full open access journals, but full OA APCs are increasing more rapidly. Full OA journals are increasing in market share. The CC BY licence is applied to the majority of articles with APCs in the cases where an institution declared a licence in the form. CC BY-NC and CC BY-NC-ND are the second most common. 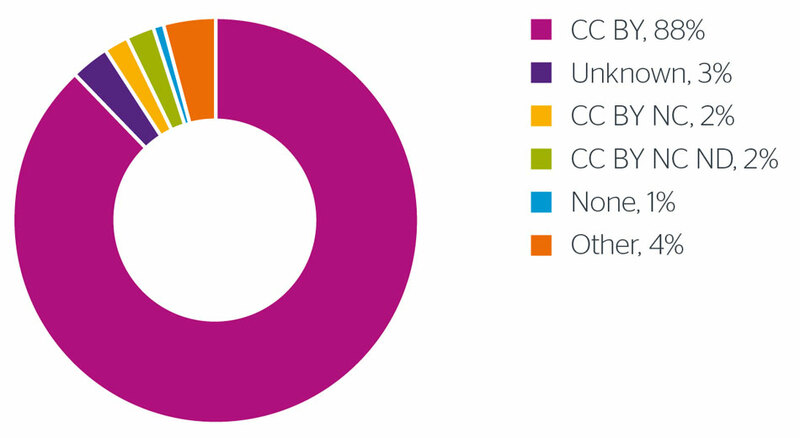 CC BY is the most common licence by far. This reflects RCUK and COAF’s mandate for CC BY. It is difficult to gather a complete picture of subscription data as institutions do not usually publicise their data. This section of the report draws on four different data sources. The most complete dataset available was gathered through Freedom of Information requests sent to 153 UK universities. This dataset comprises (FoI) subscription expenditure for 2009-2014 for ten large publishers5 (Lawson et. al., 2014). The second data set is a Society of College, National and University Libraries (SCONUL) report created for Jisc which looks at institutions’ library budgets and subscription expenditure (SCONUL, 2015a). The third data set is a private SCONUL spreadsheet of library budgets and users (SCONUL, 2015b). Finally, all APC data refers to the joined Jisc TCO/RCUK/COAF dataset described in the previous section (Jisc TCO/RCUK, 2015). Comparisons between APCs and subscriptions are only for those institutions participating in the Jisc TCO project in 2014, as these are the only institutions for which full APC data is available. A 2015 SCONUL survey shows that libraries have an average budget of £4.715m. This is £345 per user (student, faculty member, or other staff member). 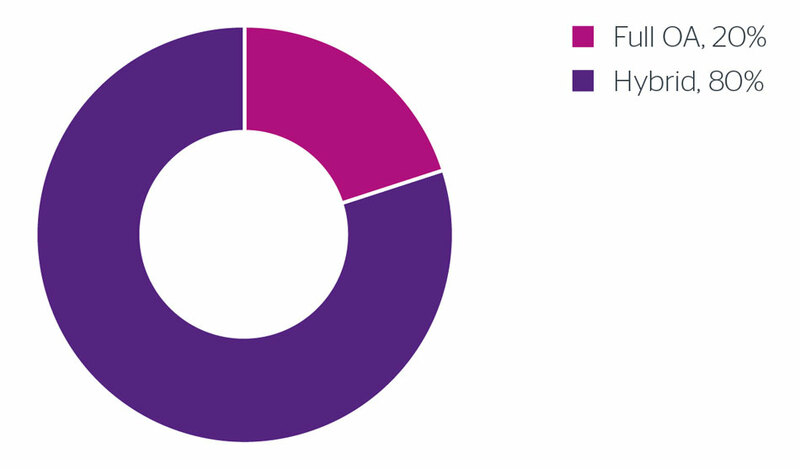 The total library budget across the 146 institutions surveyed is £688.5m (SCONUL, “Library”, 2015). Library budgets are not keeping up with inflation. When adjusted for inflation, library budgets dropped 8% between 2009 and 2014. While library budgets are growing, they are not keeping pace with inflation. Source: SCONUL, 2015a. Subscriptions expenditure is also shrinking when adjusted for inflation, but at a slower rate. 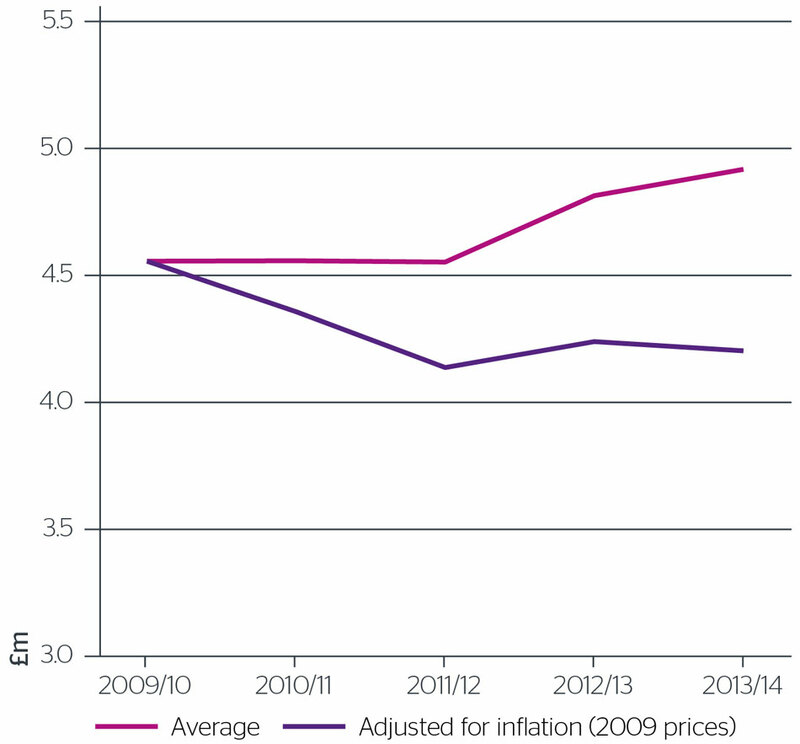 The average expenditure per institution fell by only 1% when adjusted for inflation between 2009 and 2013 (the last year for which data is available). By contrast, library budgets fell by 7% during this same period. 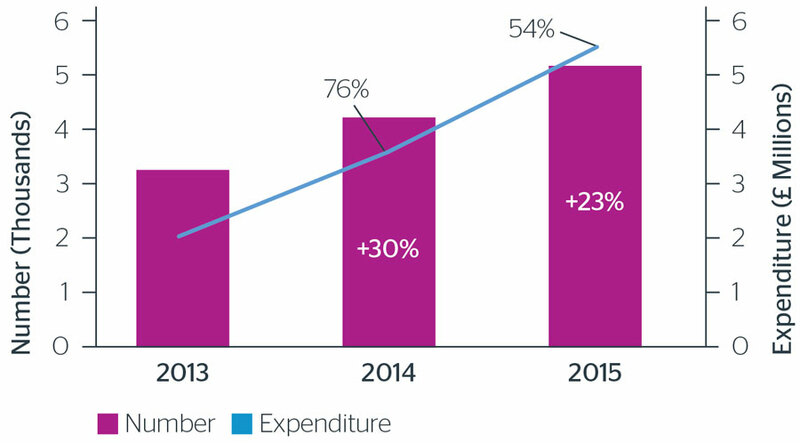 As a result, subscription expenditure is gradually taking up a larger proportion of libraries’ budgets. The FoI dataset gathered detailed information from 153 institutions about their journal subscription expenditure to ten major publishers. 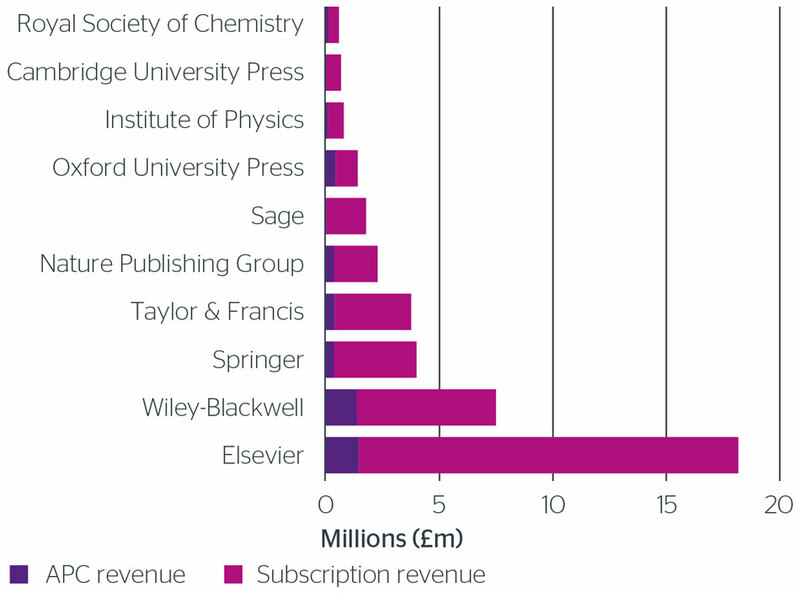 In total, the institutions spent £94m on journal subscriptions with these publishers in 2014. When the FoI data is compared with SCONUL data from previous periods, these ten publishers make up about one half (52%) of total journal expenditure. Therefore, the estimated journal subscription expenditure for 2014 is £180m. Subscriptions expenditure is stagnant when adjusted for inflation, with a drop of 1% in four years. Source: SCONUL, 2015a. Subscription expenditure gained 1.3% of library budgets in four years. Source: SCONUL, 2015a. The proportion of APCs to subscriptions varies. UCL spent nearly 40% of its total expenditure on APCs. 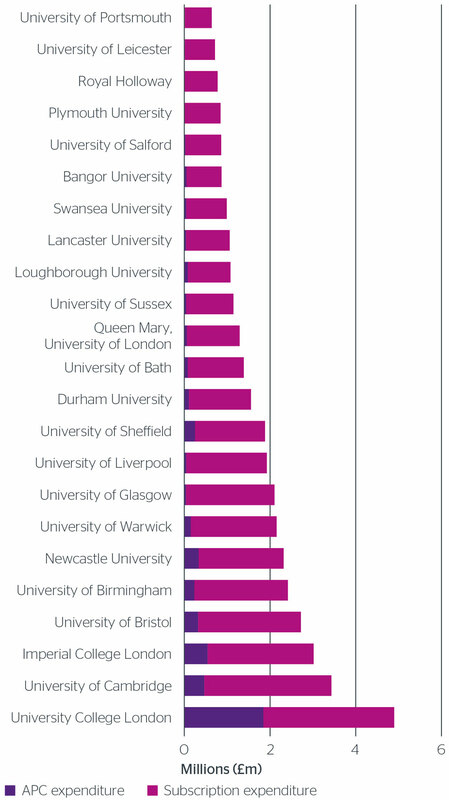 Most universities spent far less. Known APCs made up 12% of institutions’ total expenditure on journals. As this does not account for APCs paid directly by researchers rather than through an institutional or block grant, the true figure is likely higher. Known APC expenditure makes up 12% of institutions’ total spend on journals. The true figure is likely higher. Journal subscription revenue is increasing slowly and evenly for the ten major publishers. Elsevier has 42% of the market share across these publishers, down from 45% in 2010. 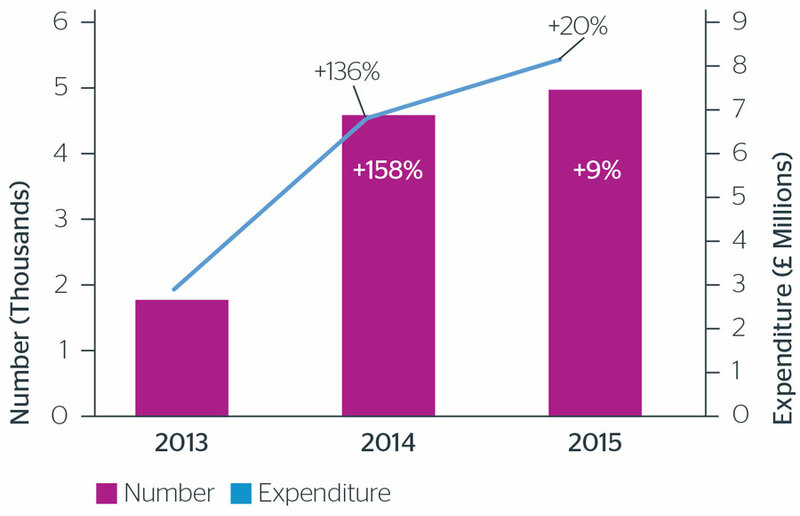 Subscription revenue from UK institutions is increasing steadily for all publishers. Publishers’ journal subscription revenues continue to grow healthily, but growth is slowing. The average growth has slowed from 7% per year to 3% per year. This may provide an incentive for publishers to look for a range of supplemental revenue streams including new journals, new OA journals, and raised APCs. Publishers still make the majority of their revenue from subscriptions. 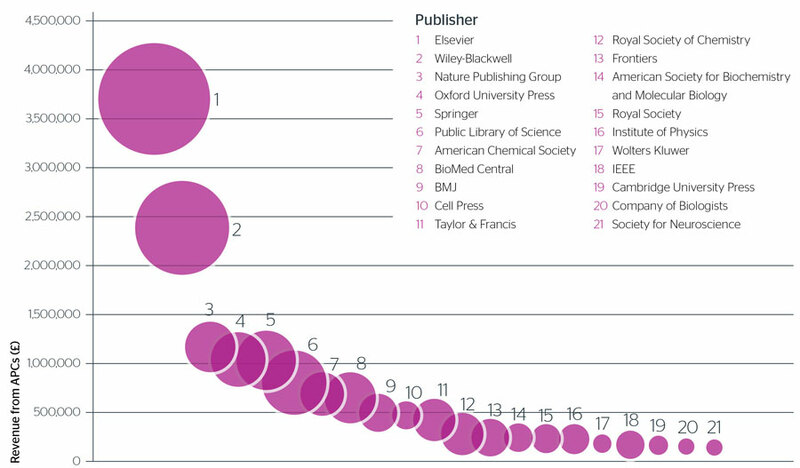 Elsevier brings in far more revenue than other publishers. Its revenue stream contains a lower proportion of APCs than any of its competitors aside from Sage and Cambridge University Press. Sage’s low proportion of APC revenue is due to its cheap APCs—its average APC is £651. Publishers’ revenues are healthy, but growth is slowing. This may lead to pressure to increase APCs. 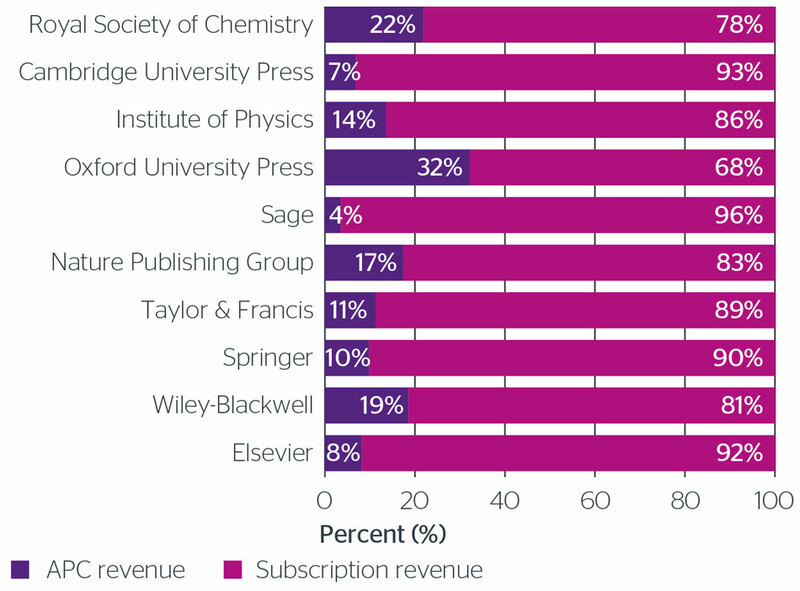 Elsevier generates more revenue from both subscriptions and APCs than any other publisher. However, Elsevier makes proportionally less revenue from APCs than most of its competitors. Analysis of APC data shows that there is a wide range in the number, expenditure, and average price for APCs across institutions and publishers. The number of APCs and expenditure on APCs is growing quickly. The APC market is part of a broader landscape of the total cost of journals. As such, the two should be considered together. While library budgets are declining with respect to inflation, APC and subscription expenditure is growing quickly. APCs currently make up at least 12% of institutions’ journal spend and are likely to grow. This partly because the number of APCs paid is rising yearly, and partly because the average APC is outpacing inflation. There is still a lot to learn about APCs. To make the most of this data, we need agreements between funders, publishers and institutions on how to record APCs paid for through voucher and offset agreements. We also need to find ways for institutions to track APCs paid directly by researchers rather than through a central fund. Jisc is committed to developing unified standards for tracking article processing charges in the UK and abroad. Part of this initiative is software for recording, reporting and aggregating APCs: Monitor Local and UK, currently in development. Institutions can record article processing charges in Monitor Local using a simple interface that automatically checks and fills in metadata. They can then profile themselves against national data using Monitor UK. As APCs become a larger part of institutions’ spending, the importance of tracking and reporting these charges increases. Open, transparent data around APCs allows institutions to assess the value of their APC spend and make budget forecasts. It allows funders to monitor the transition to open access and set policies accordingly. And it allows negotiating bodies, such as Jisc Collections, to model offsetting deals that account for APCs and subscriptions as part of a larger total cost of ownership. Releasing standardized, well-structured data about article processing charges makes the market transparent, allowing everyone in the publishing ecosystem to make informed decisions to help share research openly. 1 Any comparisons in expenditure or number of APCs paid across years (2013-2015) use only TCO data from the 14 institutions for which we have complete data available for all three years. These institutions are: University of Birmingham, University of Bristol, University of Cambridge, University College London, Cranfield University, Imperial College London, University of Liverpool, London School of Hygiene and Tropical Medicine, Queen Mary University of London, Royal Holloway University of London, University of Sheffield, University of Sussex, Swansea University, and University of Warwick. 2 The RCUK, COAF and TCO data was merged. Missing fields were supplemented with metadata from CrossRef, Europe PubMed Central and Europe PubMed. Duplicates were removed, and the data was filtered by date to ensure identical periods. Where applicable, currency conversions were based on ForEx yearly averages. 3 For this analysis, £0 APCs were excluded when calculating averages as many institutions recorded offset or unknown APCs at £0. 5 Elsevier, Wiley, Springer, Taylor & Francis, Sage, Oxford University Press, Cambridge University Press, Nature Publishing Group, Royal Society of Chemistry, and Institute of Physics Publishing. 6 Extrapolated from Lawson et. al. 2014 datset using SCONUL data for previous years as a benchmark. The Lawson dataset of ten publishers shows that expenditure across the ten publishers measured is 52% of total expenditure as measured by SCONUL. In 2014, institutions spent £608,875 across these ten publishers. I work with data in order to improve open access and scholarly communication. I work with stakeholders in the UK and abroad to standardise data and increase transparency. I gather data from a range of sources, analyse it in a reproducible way, and present the research to inform decisions on open access.